Radiochromic films are used in many radiotherapy and radiography dose measurement techniques because they can measure two-dimensional absorbed dose distributions. ,,,,,,,, However, the process is cumbersome when an absorbed dose is measured using radiochromic film as a film dosimeter, and it is necessary for the film density to be converted into an absorbed dose. For general measurement, time-scale methods requiring several dozen irradiations were performed. In addition, the creation of density-absorbed dose calibration curves for each package, i.e., the packaged unit of radiochromic film, is recommended by manufacturers to obtain high-precision data. Radiochromic film dosimeters have a considerable disadvantage in comparison with an ionization chamber (IC) dosimeter because the dosimetry process is time-consuming because of the frequent acquisition of density-absorbed dose calibration curves. The density-absorbed dose calibration curve for radiochromic film can be easily and quickly obtained using the density distribution and a step-shaped Al filter. Such a filter was designed by Gotanda et al. The X-rays are filtered by the step-shaped Al filter, and then the radiochromic film is irradiated by X-rays at different absorbed doses which penetrate Al filters with varying thicknesses. The density-absorbed dose calibration curve can be created by measuring the film density and the absorbed doses corresponding to each Al filter thickness. However, the absorbed dose that penetrates the various Al filters of the X-ray generator must be measured beforehand. The density-absorbed dose calibration curve can be easily measured in any facility when the absorbed dose that penetrates the Al filter is known. The purpose of this study is to develop a simplified method, based on the absorbed dose that penetrates the step-shaped Al filter, for creating a density-absorbed dose calibration curve using EBT3 film within a short period. 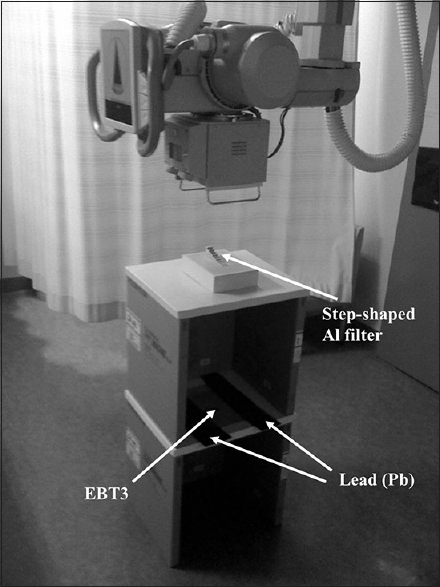 Therefore, the absorbed dose and effective energy of each X-ray penetrating the step-shaped Al filter were investigated. In addition, the simplified method was evaluated in comparison with standard methods. To evaluate the quality of the X-rays which penetrated the Al filters with various thicknesses, an X-ray generator (UD150 L-40E, Shimadzu Corporation, Kyoto, Japan) and a semiconductor multidetector (Accu-Gold and AGMS-D, Solid State kV/Dose Multisensor for Diagnostic Range Measurements, Radcal Corporation) were used. 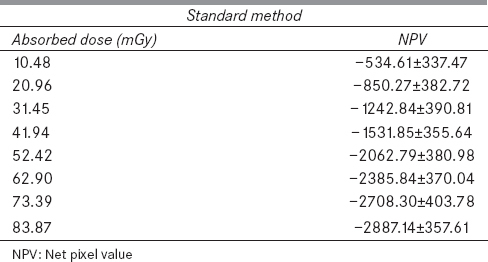 The exposure parameters of the X-ray generator were 100 kV, 100 mA, and 0.10 s. The semiconductor multidetector was able to measure the average tube voltage (±2%), exposure time (±1% +0.2 ms), absorbed dose (±5%), dose rate (±5%), and half-value layer (±10%). In a previous experiment, the difference ratios for the effective energies (from 80 kV to 120 kV) obtained by the semiconductor multidetector and standard methods with an IC dosimeter were less than about 5%. Al plates with a purity of more than 99.8% with dimensions of 100 mm × 100 mm and a thickness of 0.5 mm were used to construct the filters. The Al filters ranged from 1 mm to 15 mm in thickness. The distances from the X-ray tube to the Al filter and from the Al filter to the semiconductor multidetector were set at 500 mm to reduce the influence of scattered radiation. The exposure field was set to be more narrow (40 mm × 40 mm) on the detector area of the semiconductor multidetector. The measurement was performed three times for each exposure condition, and the mean and standard deviation of the absorbed dose and the half-value layer were calculated. The effective energy was calculated on the basis of the half-value layer. The creation of the density-absorbed dose calibration curve was performed by setting the exposure parameters of the X-ray generator to 100 kV, 250 mA, and 4.0 s (0.5 s × 8). The anode - cathode direction of the X-ray tube was set parallel to the long axis of the EBT3 film to minimize the impact of the X-ray heel effect for each Al filter. The step-shaped Al filter has a rectangular form with dimensions of 20 mm × 100 mm, and its thickness increases from 1 mm to 25 mm (the specific thicknesses are 1, 2, 3, 5, 7.5, 10, 12.5, 15, 20, and 25 mm). The thickness of the Al filter was varied in the long-axis direction of the EBT3 film. The exposed EBT3 film is shown in [Figure 1]. Regions of interest (75 pixels × 30 pixels), corresponding to the center of each Al filter thickness, were set on the EBT3 film. The central 100-mm band of the EBT3 film was set as the exposure area, and lead masking plates (thickness: 2 mm) were placed on either side of the exposure area to fix the EBT3 film. The step-shaped Al filter was placed at the center of the exposure area. EBT3 film was scanned using a flatbed scanner (EPSON ES - 2200, Seiko Epson Co., Nagano, Japan) in the RGB (48-bit) mode at 150 dpi. To eliminate any error caused by image acquisition, including the effect of the light source of the flatbed scanner, the EBT3 film was scanned by setting the scanner to the reflection mode. To scan the EBT3 film using this setting, regular white paper (PaperOne™ Copier, APRIL Fine Paper, Indonesia) with a uniform density was attached to the back of the EBT3 film. In addition, the EBT3 film was scanned both before and after exposure to eliminate the nonuniformity error of the film layer. EBT3 film was scanned 24 hrs after exposure. The EBT3 was kept at room temperature (20°C−25°C) in a shaded bag. The image data from the EBT3 film was divided into R, G, and B modes (16 bits each), and the R mode was used for high-density contrast. It was converted to a gray scale and analyzed using ImageJ version 1.48 v image analysis software (National Institute of Health, Maryland, USA). 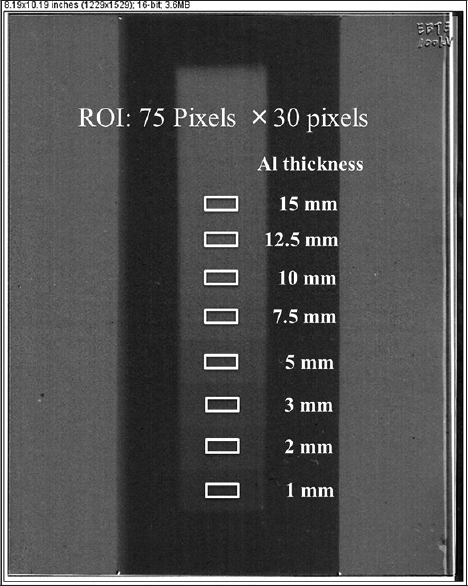 To measure the increase in the density of the EBT3 film, the image data before exposure were subtracted from the after exposure data in terms of pixel units in two dimensions and were then averaged [Figure 1]. The increase in the density was set as the net pixel value (NPV). The density-absorbed dose calibration curves for each thickness of the Al filter were calculated from linear approximation obtained using Excel software (Microsoft Office Professional 2016 Excel, Microsoft Corporation, Washington, USA). To compare the respective data from the simplified method using the step-shaped Al filter and the standard time-scale method, the averaged NPV, standard deviation, and absorbed dose were obtained. Based on this data, density-absorbed dose calibration curves were obtained for both methods at the same exposure parameter (100 kV). Various data (degree of leaning, coefficient of determination) from the calibration curves obtained using the simplified method were compared with the data obtained by the standard method. 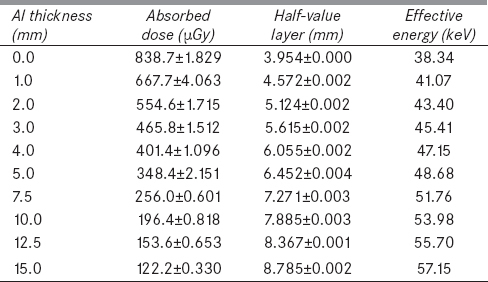 [Table 1] summarizes the absorbed dose, half-value layer, and effective energy for each thickness of the Al filter at 100 kVp using the semiconductor multidetector. The effective energies calculated for each thickness of the Al filter changed in the range of approximately 38-58 keV. The influence of the energy dependence is <0.2% in this study because the EBT3 has an energy dependence of approximately 0.2% from 30 keV to 60 keV. 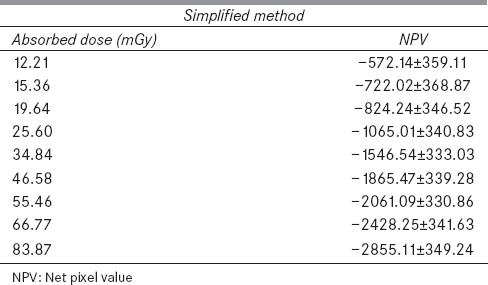 [Table 2] summarizes the absorbed dose and NPVs obtained using the simplified method with EBT3 film and a step-shaped Al filter. [Table 3] summarizes the same parameters as [Table 2] obtained using the standard time-scale method. 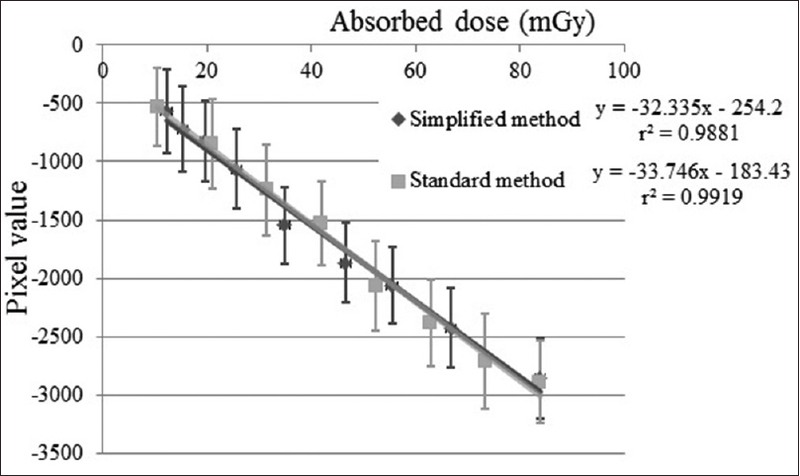 [Figure 3] shows the density-absorbed dose calibration curves. The density-absorbed dose calibration curves exhibited a linear relationship for both methods. The gradients of the density-absorbed dose calibration curves for each method were −32.336 and −33.746, and there was no significant difference (t = 1.63, df = 12, P = 0.13). The manufacturer indicates that the EBT3 film has an energy-independent dose response. This characteristic is more advantageous for the evaluation of the absorbed dose compared with other films. However, even a slight energy dependence must be considered because the intent of this study is to provide a highly precise calibration curve. In this study, Al filters with thicknesses in the range of 1-15 mm were used, and the effective energy changed from 38 keV to 58 keV. Therefore, it was necessary to evaluate the energy-dependent error in the range of effective energies. As a result of this evaluation, it can be seen that a simplified method using the step-shaped Al filter is available in this energy range because the energy-dependent error is <2% from 30 keV to 60 keV. Therefore, it is considered that the simplified method for creating a density-absorbed dose calibration curve is valid when the absorbed dose for every thickness of the Al filter is measured. In this study, the proposed simplified method for creating a density-absorbed dose calibration curve from EBT3 film was investigated on the assumption that it would be used in the low-dose range. When the density-absorbed dose calibration curve was obtained using the standard method, it was necessary to irradiate the exposure fields of eight regions 36 times. When the simplified method was performed, the total number of radiation exposures was only eight. This suggests that the simplified method can be used to create a density-absorbed dose calibration curve in a very short period compared to the standard method. A density-absorbed dose calibration curve method could be obtained using EBT3 film at a low energy dependence with a step-shaped Al filter in a very short period compared to the standard method. Therefore, the creation of density-absorbed dose calibration curves of a packaged unit of EBT3 film, as recommended by the manufacturer, could be easily executed using the simplified method. In light of these findings, it is considered that the simplified method using EBT3 film offers a simple means of determining the density-absorbed dose calibration curve in a low absorbed dose range such as the diagnostic range. This study was supported by JSPS KAKENHI Grant Number 16K21553. Ashland; 2016. Available from: http://www.gafchromic.com/documents/BallCube_II_EBT2_3_box_insert_201404.pdf. [Last accessed on 2016 Oct 20]. Butson MJ, Yu PK, Cheung T, Metcalfe P. Radiochromic film for medical radiation dosimetry. Mater Sci Eng R 2003;41:61-120. Gotanda T, Katsuda T, Gotanda R, Tabuchi A, Yamamoto K, Kuwano T, et al. Evaluation of effective energy using radiochromic film and a step-shaped aluminum filter. Australas Phys Eng Sci Med 2011;34:213-22. Gotanda R, Katsuda T, Gotanda T, Eguchi M, Takewa S, Tabuchi A, et al. Computed tomography phantom for radiochromic film dosimetry. Australas Phys Eng Sci Med 2007;30:194-9. Gotanda R, Katsuda T, Gotanda T, Tabuchi A, Yatake H, Takeda Y. Dose distribution in pediatric CT head examination using a new phantom with radiochromic film. Australas Phys Eng Sci Med 2008;31:339-44. Gotanda T, Katsuda T, Gotanda R, Tabuchi A, Yamamoto K, Kuwano T, et al. Half-value layer measurement: Simple process method using radiochromic film. Australas Phys Eng Sci Med 2009;32:150-8. Gotanda T, Katsuda T, Gotanda R, Tabuchi A, Yamamoto K, Kuwano T, et al. Evaluation of effective energy for QA and QC: Measurement of half-value layer using radiochromic film density. Australas Phys Eng Sci Med 2009;32:26-9. Kairn T, Hardcastle N, Kenny J, Meldrum R, Tomé WA, Aland T. EBT2 radiochromic film for quality assurance of complex IMRT treatments of the prostate: Micro-collimated IMRT, RapidArc, and TomoTherapy. Australas Phys Eng Sci Med 2011;34:333-43. Dini SA, Koona RA, Ashburn JR, Meigoonia AS. Dosimetric evaluation of GAFCHROMIC XR type T and XR type R films. J Appl Clin Med Phys 2005;6:114-34. Butson MJ, Cheung T, Yu PK. XR type-R radiochromic film X-ray energy response. Phys Med Biol 2005;50:N195-9. Fletcher CL, Mills JA. An assessment of GafChromic film for measuring 50 kV and 100 kV percentage depth dose curves. Phys Med Biol 2008;53:N209-18. Rink A, Vitkin IA, Jaffray DA. Energy dependence (75 kVp to 18 MV) of radiochromic films assessed using a real-time optical dosimeter. Med Phys 2007;34:458-63. Butson MJ, Cheung T, Yu PK. Weak energy dependence of EBT gafchromic film dose response in the 50 kVp-10 MVp X-ray range. Appl Radiat Isot 2006;64:60-2. Sutherland JG, Rogers DW. Monte Carlo calculated absorbed-dose energy dependence of EBT and EBT2 film. Med Phys 2010;37:1110-6. Butson MJ, Cheung T, Yu PK, Alnawaf H. Dose and absorption spectra response of EBT2 Gafchromic film to high energy X-rays. Australas Phys Eng Sci Med 2009;32:196-202. Villarreal-Barajas JE, Khan RF. Energy response of EBT3 radiochromic films: Implications for dosimetry in kilovoltage range. J Appl Clin Med Phys 2014;15:4439. Gotanda T, Katsuda T, Gotanda R, Kuwano T, Akagawa T, Tanki N, et al. Energy response of the GAFCHROMIC EBT3 in diagnosis range. IFMBE Proc 2015;51:752-5. Gotanda T, Katsuda T, Akagawa T, Gotanda R, Tabuchi A, Yamamoto K, et al. Evaluation of GAFCHROMIC EBT2 dosimetry for the low dose range using a flat-bed scanner with the reflection mode. Australas Phys Eng Sci Med 2013;36:59-63. Butson E, Alnawaf H, Yu PK, Butson M. Scanner uniformity improvements for radiochromic film analysis with matt reflectance backing. Australas Phys Eng Sci Med 2011;34:401-7. Radcal; 2016. Available from: http://www.radcal.com/agms-d-detail. [Last accessed on 2016 Oct 03].